It’s very rare that a man speaks at the Most Powerful Women Summit, yet for the 2010 edition of the event sponsored by Fortune magazine at Carnegie Mellon Auditorium, the speaker wasn’t just a man, he was the most powerful man in the world. Well, the most powerful man in the world in a political sense. US President Barack Obama was there, speaking to honor his wife, Michelle, who was just named the world’s most powerful woman. 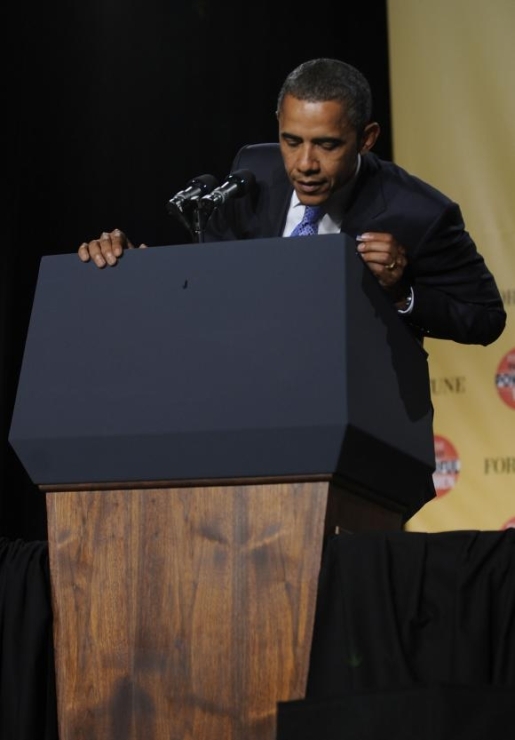 Unfortunately for President Obama, there wasn’t The World’s Most Powerful Screws there, as during his speech the Presidential Seal falls off the podium and lands on the stage with a thud!